Feeling unsure about the computer? Maybe you just want to be comfortable with your computer skills! OIC’s Real World Computer Literacy basic class will give you the skills you need to become ready. Cost if $40 which must be pre-paid by Friday, February 15th. 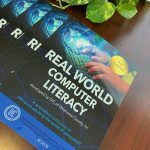 Students will received the 50-page Real World Computer Literacy book and quick reference guide. OIC is offering a 3-week basic computer class on Saturdays from 10:00 am to 12:00 pm. February 23, 2019 – “What’s this button for?” – Understanding how the computer works; Styles, and Configurations of the computer. March 2, 2019 – “Playing on the Internet” – Learning how to set up Email accounts, navigating through the internet, create files and folders. March 9, 2019 – “Putting it all together” – Complete a project that let’s practice everything you have learned. Is there any possible way that I can still enroll for computer class of February 15th? Yes you can. Call us on Monday and we can take care of you. Thank you for your interest in the computer class.